Win Jumanji: Welcome to the Jungle: Game on for this hilarious family adventure | SWITCH. When four high-school kids discover an old video console with a game they’ve never heard of - Jumanji - they are immediately drawn into the game’s jungle setting, literally becoming the adult avatars they chose. Gamer Spencer (Dwayne “The Rock” Johnson, 'Moana', 'Journey 2: The Mysterious Island') becomes a brawny adventurer, football jock Fridge (Kevin Hart, 'Ride Along' series, 'Central Intelligence') becomes an Einstein, popular girl Bethany becomes a middle-aged professor (Jack Black, 'School of Rock', 'Nacho Libre') and wallflower Martha (Karen Gillan, 'Selfie', 'Guardians of the Galaxy' series) becomes a badass warrior. What they soon discover is that you don't just play Jumanji - you must survive it. To beat the game and return to the real world, they'll have to embark on the most dangerous adventure of their lives, discover what happened to missing schoolboy Alex Vreek (Nick Jonas, 'Scream Queens', 'Camp Rock') and work together to finish the game - or they'll be stuck in there forever! Click here to read our theatrical review of 'Jumanji: Welcome to the Jungle'. The 'Jumanji: Welcome To The Jungle' competition has now closed. Winners will be announced shortly. Competition opens at 5pm AEST on Sunday 8th April 2018 and closes at 11:59pm AEST on Sunday 15th April 2018. Five winners will be chosen at random on Monday 16th April 2018. To successfully win, entrants must fulfil the above entry conditions before the time the competition closes. Current members/followers are eligible to enter the competition. Only one entry per person. Only one winner per household. To be a valid winner, the entrant must not have won a prize from SWITCH within the last 28 days. Each winner will receive one Blu-ray copy of 'Jumanji: Welcome To The Jungle'. By entering, you agree to receive occasional emails from SWITCH in the future. If you decide to unsubscribe from these updates, any further entries will not be applicable. Only Australian residents are eligible to enter. 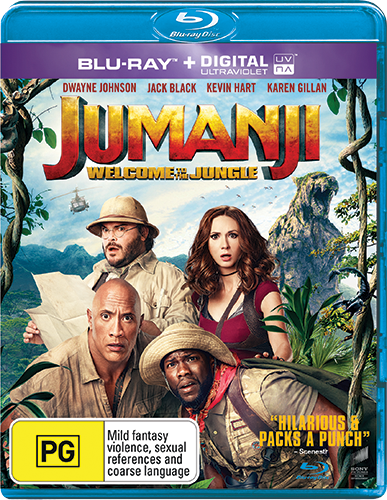 'Jumanji: Welcome To The Jungle' is available on 3D Blu-ray, 4K Ultra HD, Blu-ray, Digital and DVD on Wednesday the 11th April 2018 from Universal Sony.